Candyroot, photographed at Seabranch Preserve State Park, Stuart, Martin County, in May 2015. With a name like candyroot, Polygala nana, you'd think for sure this is something edible. Possibly even tasty. I mean it's candyroot, after all. 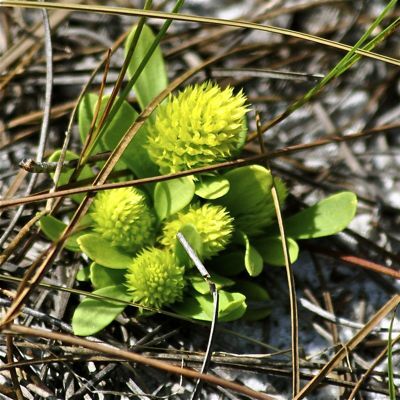 But no, not even Green Deane of Eat the Weeds, one of Florida's foremost experts on edible wild things, can say for sure whether candyroot is edible. He hasn't tried it. Passing on info gathered from another trusted expert, he says the root is chewable and can be used to make a tea. On the other hand, he also recommends using caution because other members of the same genus are used medicinally as an emetic. In plain words, they're used to make you toss your cookies. In any regard, candyroot is a Florida native, found in most of the 67 counties, with Miami-Dade and Monroe being exceptions. It's also found throughout much of the Southeast as far north as North Carolina, Tennessee and Arkansas and as far west as Texas. 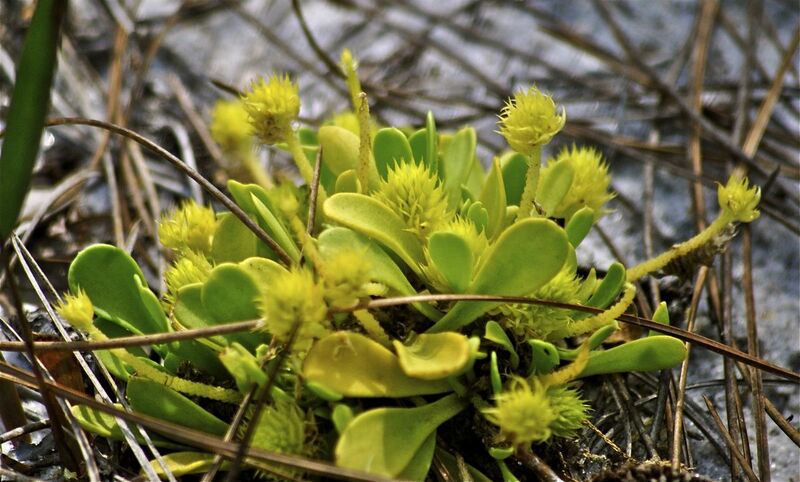 The Institute for Regional Conservation considers it a rare plant in South Florida, but neither the feds or Florida list it as either threatened or endangered. It does have endangered status in Tennessee. Candyroot is a small, compact, annual plant that grows in clumps and reaches only a few inches off the ground. Its leaves are thick, almost like a succulent, and are shaped like those little wooden spoons used to eat cups of ice cream. It flowers in spring and summer, sending up stems with clusters of blooms doubling the height of the plant. Even then, it's hardly a giant. Polygala means many milk, the first part in reference to the plant's multiple blooms, the second to someone's observation that the presence of these plant indicated a fertile field for grazing livestock. The second word of the name, nana, means small. There are 23 species of polygala in Florida, 14 of which are found in South Florida. 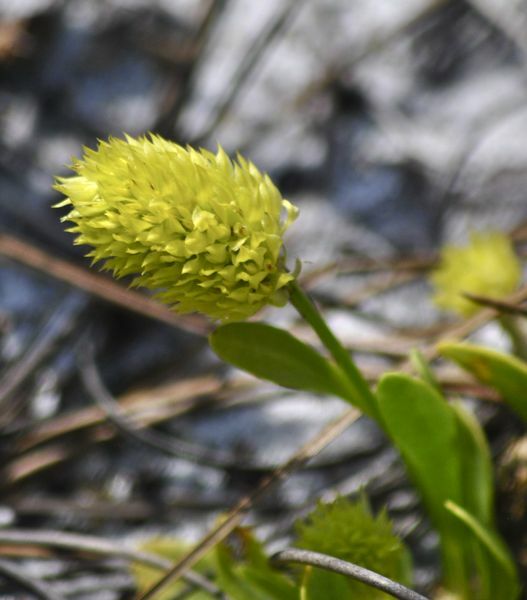 One of them, Polygala smallii, aka tiny milkwort, is a close cousin of candyroot but it's extremely rare and only grows along portions of the Atlantic Ridge between Miami-Dade and St. Lucie counties. By the way, smallii is a reference to J.K. Small, the naturalist who first described the plant, rather than its diminutive size. Habitats for candyroot include moist pinelands and wet meadows. Candyroot is a member of Polygalaceae, the milkwort family. Other common names include bachelor's button and bachelor's buttons. In Tennesse, it's called dwarf milkwort.